Hello and welcome to the 499th installment of the SWD. Left over Yekîneyên Parastina Gel’s (People’s Protection Units) improvised explosive device killed two civilians near the city of Jinderes in Afrin region. Hayat Tahrir al-Sham conducted security operations in Al-Habit area, south of Idlib. The operations were aimed at arresting Syrian government’s sleeper cells and individuals that promote reconciliation with the government. According to the reports, Hayat Tahrir al-Sham arrested around 15 individuals during the operations. 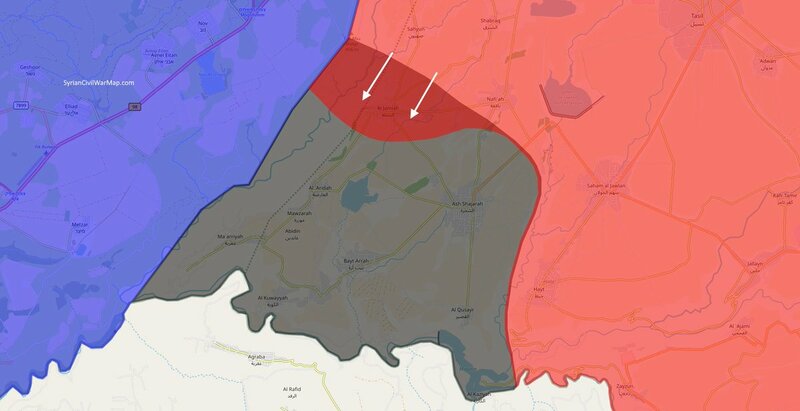 Syrian Arab Army and allies captured Al-Jamlah, Nafiyah, Al-Awad, Abu Karaja, and Abu Refat from the Islamic State-affiliated Jaysh Khalid ibn al-Walid in Al-Yarmouk basin. Two elements of the Afghan Local Police surrendered to the Islamic Emirate of Afghanistan (Taliban) in Yokhin area of Gurziwan district. Afghan National Security Forces killed four and wounded six elements of the Islamic Emirate of Afghanistan in Dashti Qala district. Islamic Emirate of Afghanistan’s Al-Emarah News claimed that the group captured Khwaja Ghar district and its centers with surrounding checkpoints and installations from the Afghan National Security Forces. Afghan National Security Forces killed two elements of the Islamic Emirate of Afghanistan and destroyed a vehicle in Mohammad Agha district. Afghan National Security Forces killed eight and arrested 50 elements of the Islamic Emirate of Afghanistan in Sayid Karam district. Afghan National Security Forces arrested two elements of the Islamic Emirate of Afghanistan in Sabari district. Residents of Feroz Koh area pledged their allegiance to the Islamic Emirate of Afghanistan. The aforementioned area consists of around 100 villages and 15000 families, under the leadership of tribal elder Haji Abdurrehman. The tribal elder reportedly handed over 1000 assault rifles, 100 PK machine guns, 80 RPG launchers, and two DShK heavy machine guns to the Islamic Emirate of Afghanistan. Islamic Emirate of Afghanistan ambushed a group of Afghan National Army’s elements in Ghazni district, destroying an armored vehicle and killing three soldiers. Islamic Emirate of Afghanistan’s snipers killed two elements of the Afghan National Army in Sar Khodoz area of Nawa-I-Barakzayi district. Islamic Emirate of Afghanistan’s improvised explosive device destroyed an Afghan National Army’s armored personnel carrier in Dokhana area of Nesh district. Similarly, two Islamic Emirate of Afghanistan’s improvised explosive devices destroyed additional two Afghan National Army’s armored personnel carriers in Seyah Sang Dara and Sar Band areas of Arghandab district.